Today's post is short and sweet since its been quite a busy week for me! I have two big projects that I have to finish for my job before I leave next Friday, and I also have to start packing up again for school. I also have a lot of post scheduling to do for the next few weeks as I get settled back into my school routine. So today I thought a little break from the long posts would be nice and you could do some online shopping at one of my favorite higher end brands, Tory Burch! Click here to access the sale! The sale ends Friday, so get these items while they're up to 70% off! Also, it is the private sale, so if you have any issues accessing the site you can use my email theclassicbrunette@gmail.com to get in! Have you bought anything from the sale? The blue top is adorable! It would make a great fall transition piece with white jeans! Oh goodness so cute! I want those sunglasses! LOVE those wedges! These kind of sales always hurt my credit card! That pink top is so darling! These tops are sooooo cute! Have to get my hands on them asap! Those glasses are a much needed addition!! So cute! Love your picks girl! Need to get that blue dress! Love that little dress! Thanks for the heads-up! So many great picks. I love that top its adorable! Tory can do no wrong, loving all of these picks!! The blue tank top is adorable! That blue tassel tank needs to get in my closet! I love the blue tassel tank, I was thinking of getting it but unfortunately I can't wear it to school so it's not very practical! Ahh love all these!! Especially that blue tank!! Tory is seriously one of my favorite brands! I can always find something I like in the store! Totally checking out the sale now to see what goodies I can snag! That dress is so cute!!!! Absolutely love it. Those wedges and the dress are so cute...I can't pick which I love the most! I so want the cognac wallet because it matches with the Tory purse that I already have. So many cute picks! I love that little tassel hem dress! Your selection is fab. 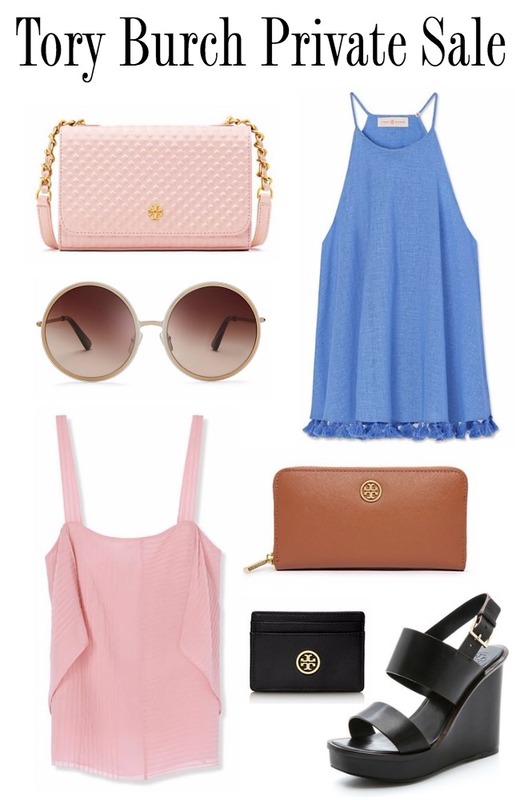 Our fav items are the round shades and pink purse. Tory makes some lovely items. That tassel top so cute and I love that pink bag! Love that pink top and those shoes! Great picks! I love Tory Burch! So many great picks. Loving that pink top! I just can't handle it, I want everything!! That little pink purse needs to come home with me! I've been looking for a new wallet and I think this sale will be the perfect time to find one! Love Tory Burch! I especially love those sunnies and the bag. Fab! In love with that wallet! Gorgeous, classic piece! Loving all of your picks! That pink purse is my fave! Wow, I love the sunglasses! Are they also on sale? Loving those sandals. Very cute! Those sunnies are so cool and the top is too cute. Love all your picks!